Audio conversion is one of the audio processing tasks that you will constantly be facing due to the diversity of audio formats. 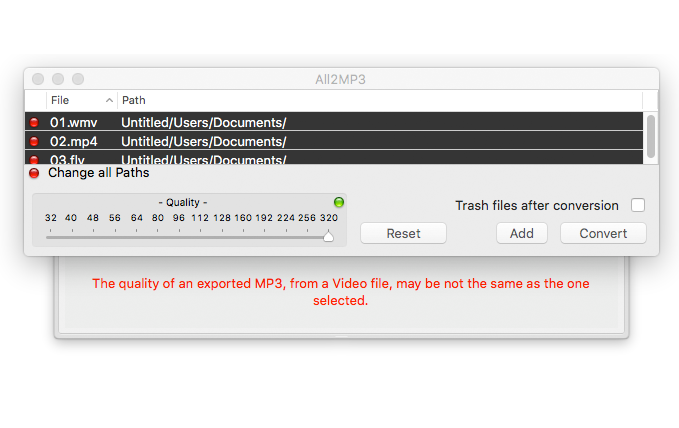 Unlike MP3, some of the audio files you downloaded or created from recording or composing tools come in less popular format, making them harder to accept by many devices and media player software. 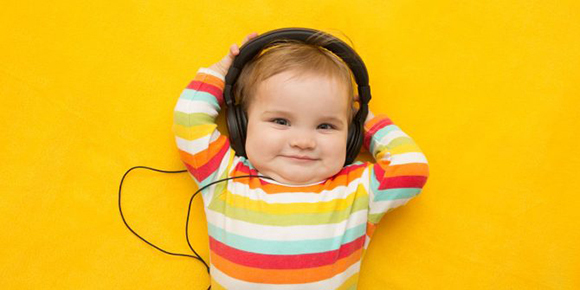 A rational thing we do when encountering compatibility issues is to convert audio files in unrecognizable formats into MP3, which is a universal format readable by all device and media software. Free Audio Converter for Mac is something we need. Luckily, for Windows users, they have sufficient choices to do the audio conversion job, for free; but things are not the same for Mac users, who may have to suffer from high price or low conversion quality due to lack of audio converter applications. In this post, we’ll introduce two free audio converter software for Mac as well as Windows users to convert audio to MP3. Let’s find out how they work and why they are the best. 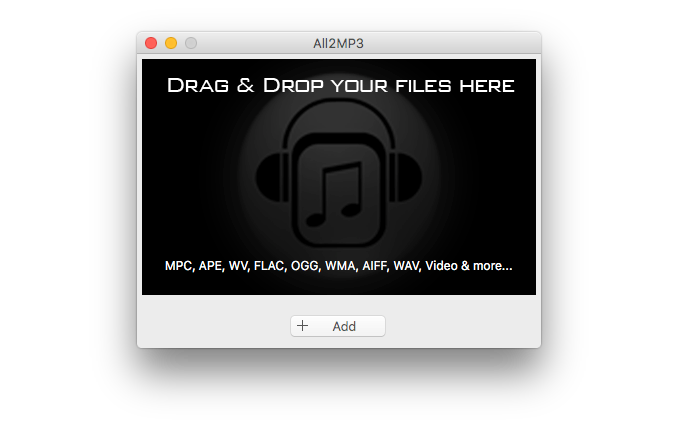 All2MP3 for Mac is one of the earliest and easiest free audio converter for Mac OS. It supports almost all audio formats as input and converts them to MP3. Meanwhile, it can extract MP3 from any video files. The whole audio to MP3 conversion process can be done by only clicking your mouse buttons. It provides quality control that is simple to adjust, making it possible to fit your precise requirement for other usages. Last but not least, it is light and works really fast. Install All2MP3 for Mac and open it on your Mac. The file input is very easy. Just drag the audio files you want to convert in. You can also use the “Add” button at the middle bottom to open a window to input your files. Change the output settings in the activated window. You can choose the output directory, the output quality (from 32 to 320 Kbps) and whether to trash files after conversion. Click “Convert” and the conversion is being processed. 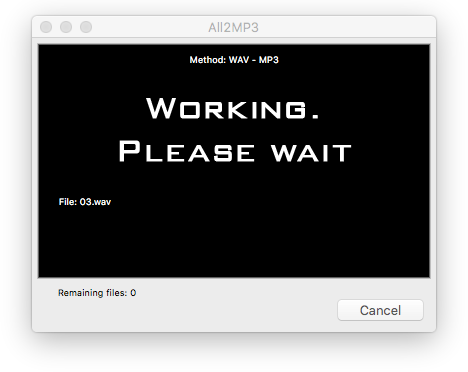 Now you just need to be patient and when it’s done, the output MP3 files will be found in the output directory you set. Cloud Convert is a online service that allows you to convert audio files for free without installing any software. It allows you to convert nearly any type of files including audio, video, document, archive, image and so on. Its conversion process is similar to other free online converters, so the basics may be helpful even if you choose other services like Online Convert and Zamzar. You can learn more about Cloud Convert in the instruction below. Go to Cloud Convert website, click “Select Files” and then select the desired audio files for the conversion. You can also drag the files into the site’s conversion window. You are allowed to select the file from other sources like DropBox, OneDrive, Google Drive and a URL with the down button. In the drop-down menu of format, select “MP3” format. For the output settings, click the wrench icon on the right side. From there, you can adjust audio channels, sampling frequency, trim audio and more. After that, click the red “Start Conversion” button to start the conversion. When it’s finished, you will see a green “Download” button and click it to save the converted file in your default download folder. Like mentioned above, Windows users have plenty of free choices in audio conversion so what they should focus on is how to pick up an excellent one from similar products. 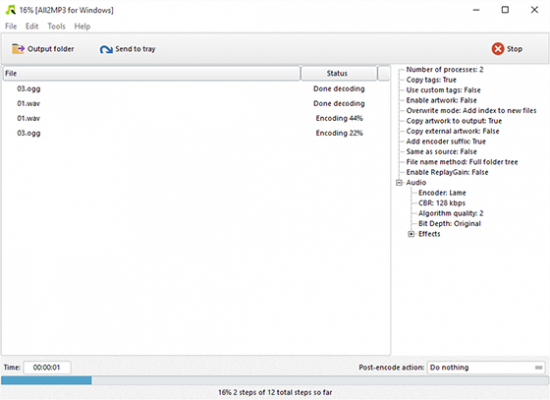 All2MP3 for Windows is another audio converter from us and it provides almost every feature that a user can expect just as Softpedia said. It can convert audio to MP3 and a ton of other formats; convert video to audio; change output quality with presets or manual adjustment; It can also trim audio, rip CD, edit tags and artwork image, etc. Install All2MP3 for Windows and open it on your Windows computer. Click “Add” to add any audio files you want. 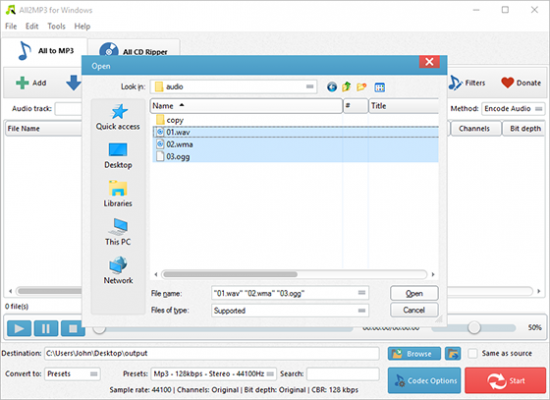 It allows you to add all files in a folder/multiple folders at one time. Use “Presets” or “Codec” from “Settings Type” to adjust the output quality. Click “Browse” to set the output directory. Click “Start” to start audio conversion and wait until it’s done. Use “Open” button to find the converted audio files. Now we have shown you how to use the best free audio converter for Mac and Windows to get the audio conversion work done. Both of the tools are free to download and use, without any malware, hidden cost or any other strings attached. If you are in a special situation that you can’t or are not willing to install anything on your computer, you can always go to online audio converter service for help.